Take part in exciting Easter activities and celebrate the release of HOP on Blu-ray™ and DVD at Simon malls! cincomom March 20, 2012 Comments Off on Take part in exciting Easter activities and celebrate the release of HOP on Blu-ray™ and DVD at Simon malls! ATLANTA — Simon malls and Universal Studios Home Entertainment are encouraging families to get hopping to Atlanta-area Simon malls for a series of special Easter festivities. Mall of Georgia and Town Center at Cobb invite area kids and parents to attend a family-friendly Easter Photo Experience event, taking place through the holiday. 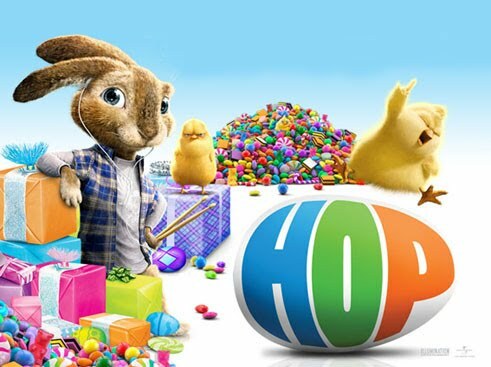 Kids will have the chance to visit with the sought-after Easter Bunny and get ready for the Blu-ray™/DVD release of HOP from Universal Studios Home Entertainment on March 23, the all-new comedy about candy, chicks and rock ‘n’ roll, and even meet the movie’s star E.B. in person! At Gwinnett Place, Northlake Mall, Mall of Georgia and Town Center at Cobb, children can take a photo on a colorful set with the legendary Easter Bunny and a life-sized standee of E.B., the rabbit from HOP who dreams of becoming a rock star drummer. Families will enjoy a sneak peek of the HOP Blu-ray™/DVD while waiting to pose for a picture and receive an engaging HOP activity sheet after capturing their sensational Easter snapshot. To celebrate the HOP Blu-ray™/DVD launch date on March 23, kids will have the chance to receive an adorable HOP plush character given away randomly every hour, at the top of the hour during the Easter Photo Experience event. Families can visit www.simon.com for additional Easter Photo Experience schedule details. The Simon Kidgits Clubs at Mall of Georgia and Town Center at Cobb will also host special events on Saturday, March 24 where kids can create their own Easter drum set and jam out to the catchy tune “I Want Candy” at the mall, just like HOP’s hilarious rockin’ rabbit E.B., and participate in various fun, Easter-themed activities. Kids will receive terrific take-home treats, including a set of pencil drumsticks (while supplies last), HOP stickers and an activity sheet. They can also interact with a costumed character E.B. from HOP (Mall of Georgia, 8:30-10 a.m.; Town Center at Cobb 1-3 p.m.). For more information about the Simon Kidgits Club and Universal Studios Home Entertainment Easter events, visit www.simon.com/kidgits. The Simon Kidgits Club is a fun and informative program that focuses on health, wellness, education, safety and entertainment for children ages 3-8. Since 2003, the Simon Kidgits Club has kept children and parents alike amused with various events and activities while providing incentives for club members, such as special offers, rewards and games. #DeliveryManMovie Trailer released! Meet a baby daddy of epic proportions! Sneek Peek of Disney’s First Female Action Hero…And she’s BRAVE! The Hunger Games Tour Hits Atlanta! And the Muppets? Winnie the Pooh Screening at Atlantic Station and Which Pooh Character Are You?